View your KeyMission 360 and KeyMission 170 photos and videos with the same excitement as when they were captured. 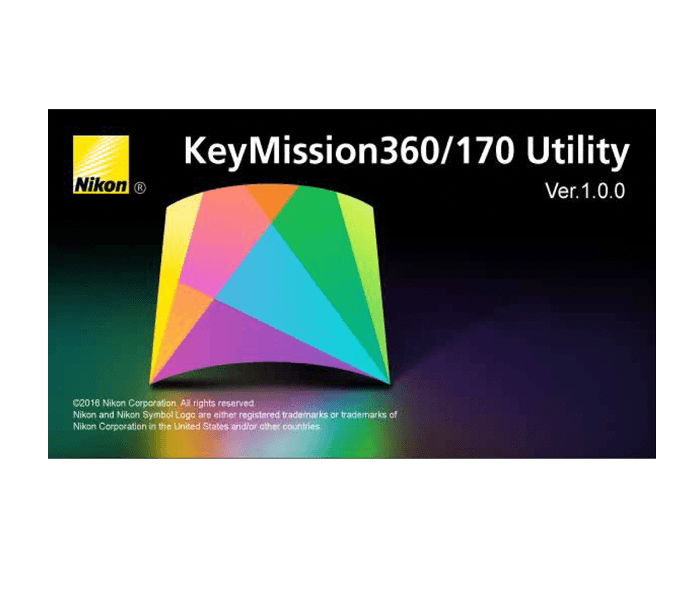 Nikon KeyMission 360/170 Utility lets you choose the viewing angle of 360° content and export the footage to create new movies, export cropped images, add simple effects like sepia/monochrome or fade in/out and background tracks, and create movies for upload to YouTube. You can trim photos or movies, save a frame of the current movie, edit highlight tags and create a movie digest by splicing together footage from around each highlight tag. When viewing spherical 360° content in the utility software, simply drag the picture or use the viewpoint control to choose the viewpoint, zoom in or out, select from 4:3 or 16:9 aspect ratio, and view your content in split view which lets you simultaneously view what the front and back cameras lenses recorded. Adjust camera settings when your KeyMission 360 or KeyMission 170 is connected to the computer via a USB cable. You can adjust photo and movie settings including frame rate, movie mode and image size, shooting options such as Active D-Lighting, exposure compensation and white balance, and camera settings including sound, format card, date and time, and network settings. Macintosh System Requirements: Mac OS: OS X 10.11.6, OS X 10.10.5, OS X 10.9.5; CPU: Photos: Intel Core or Xeon series; Movies: Core Duo 2 GHz or better required for playback; Intel Core i5 or better required for editing and recommended when viewing HD or Full HD movies; Intel Core i7 3.5 GHz or better required when viewing or editing 4K movies shot with the KeyMission 360 or 170; Graphics Card: Core i5 or i7 built-in graphics, or add-on graphics card with at least 512 Mbytes of video memory; Intel HD Graphics 4000 or better required for 4K movies shot with the KeyMission 360 and 170 (Note: We recommend that you update to the latest version of the graphics controller drivers. See the manufacturer or retailer for details. ); RAM: 2 GB or more (4 GB or more recommended); 8 GB or more when editing 4K movies shot with the KeyMission 360 or 170; Hard disk space: A minimum of 1 GB of free disk space available on the start-up disk at installation and when the software is running (3 GB or more recommended); Monitor: Resolution: 1024 × 768 pixels (XGA) or more (1366 × 768 pixels or more recommended), Colors: 24-bit color (millions of colors) or more; File transfer: A computer with built-in USB ports is required. Operation is not guaranteed when the camera is connected via a USB hub or keyboard. File transfer is available only with KeyMission 360 and 170 cameras. Supported cameras: KeyMission 360, KeyMission 170. Supported file types: JPEG images (Exif 2.3 compliant); MP4 movies (video: H.264/MPEG-4 AVC; audio: AAC stereo) shot with the KeyMission 360 and 170. Misc: Internet connection required for the confirmation of the movie license agreement at installation and for the use of online help and provision of update information post-installation. PC System Requirements: Windows: Microsoft Windows 10 Home, Microsoft Windows 10 Pro, Microsoft Windows 10 Enterprise, Microsoft Windows 8.1, Microsoft Windows 8.1 Pro, Microsoft Windows 8.1 Enterprise, Microsoft Windows 7 Home Basic, Microsoft Windows 7 Home Premium Service Pack 1, Microsoft Windows 7 Professional Service Pack 1, Microsoft Windows 7 Enterprise Service Pack 1, Microsoft Windows 7 Ultimate Service Pack 1. (Note: Pre-installed versions only. Runs as a native 32-bit application on 64-bit systems.) CPU: Photos: Intel Celeron, Pentium 4, or Core i series, 1.6 GHz or better; Movies: Pentium D 3.0 GHz or better required for playback; Intel Core i5 or better required for editing and recommended when viewing HD or Full HD movies; Intel Core i7 3.5 GHz or better required when viewing or editing 4K movies shot with the KeyMission 360 or 170; Graphics Card: A CPU or graphics card with DirectX 9 or later, OpenGL version 2.0 or later, and 512 Mbytes or more of video memory (Note: We recommend that you update to the latest version of the graphics controller drivers. See the manufacturer or retailer for details. ); RAM: 32-bit edition: 1 GB or more (2 GB or more recommended), 64-bit edition: 2 GB or more (4 GB or more recommended); 8 GB or more when editing 4K movies shot with the KeyMission 360 or 170; Hard disk space: A minimum of 1 GB of free disk space available on the start-up disk at installation and when the software is running (3 GB or more recommended); Monitor: Resolution: 1024 × 768 pixels (XGA) or more (1366 × 768 pixels or more recommended), Colors: 24-bit color (True Color) or more; File transfer: A computer with built-in USB ports is required. Operation is not guaranteed when the camera is connected via a USB hub or keyboard. File transfer is available only with KeyMission 360 and 170 cameras. Supported cameras: KeyMission 360, KeyMission 170. Supported file types: JPEG images (Exif 2.3 compliant); MP4 movies (video: H.264/MPEG-4 AVC; audio: AAC stereo) shot with the KeyMission 360 and 170. Misc: Internet connection required for the confirmation of the movie license agreement at installation and for the use of online help and provision of update information post-installation.